[via Junk Charts] in the New York Times uses a “tornado” chart (a population pyramid-like chart) to display two series, advertising spending in measured (traditional media) and unmeasured (Internet…) channels. When discussing how to create population pyramids, I wrote that I don’t really like tornado charts, specially if you only have two series, because it takes up too much space and you can’t compare each entity (age group or, in the example below, corporations). Both clearly show the ranking by measured channels and the proportion of advertising spending in the unmeasured channels. Also, it is a safe format for the target audience. 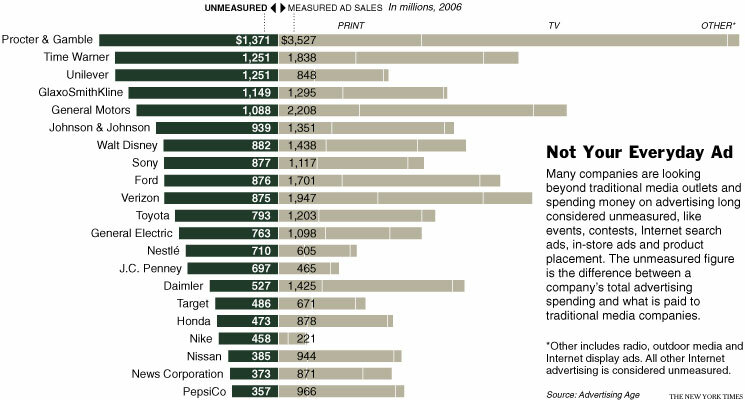 The original chart sorts corporations by advertising spending in the unmeasured channels. The sorting key depends on what you want to say, but you should play with the different options before selecting the final solution. As a rule of thumb, a bar chart should be sorted by the series with larger values and/or the highest variability. Sorting this chart by measured channels one can easily spot the higher proportion of spending in the unmeasured channels at the bottom. If “graphical excellence is that which gives to the viewer the greatest number of ideas” (Tufte), then in this case you should select the “measured” series as the sorting key. What about the part where they break down the measured side into three more categories (Print, TV and Other)? I definitely agree that the overlapping bar chart makes it easier to compare measured vs. unmeasured. Another option would be to just show the difference in a verticle bar chart where zero is set in the middle of the chart and negative is to the left and positive to the right. The difference being you combine the two values and just plot a single point. Not only the break down is difficult to compare but also there is no point in showing it. I would use a second chart, if needed.